Welcome to Morobinbarrystories .com! Please join me on twitter @morobinbarry. This site is for Bee Gee fans everywhere who would like to read and share stories of fun, love, joy and inspiration for Barry, Robin and Maurice Gibb. (Andy is not forgotten and is being showcased during his birth month of March). If you’d like to share a story, please email me at morobinbarrystories@gmail.com. Stories will be posted weekly, some from my collected tales and some new stories as they come in. Others I will save for my book, which is in progress. The celebration of “Andy love” continues. I find that Andy Gibb fans are steadfastly dedicated to keeping his memory alive and appreciate the talent and love he shared with the world. This story comes from Andrea, who is one of those loving fans. 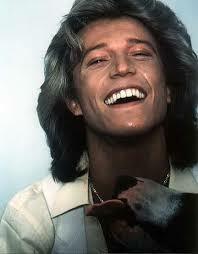 When I was 14, my world revolved around Andy Gibb. I drove my mom to distraction because I was obsessed with him. Every minute of my day related to him in some way. I’d get up in the morning and play his albums while I got ready for school. I was a freshman in high school and had my notebooks decorated with Andy stickers and pictures. My locker was covered top to bottom with Andy’s face. My English teacher frowned and argued but finally agreed to let me write my biography paper about Andy. My best girlfriends jokingly called me “double A” because both our names began with A and I’d always draw two A letters inside of a heart for him and I. The obnoxious boys in my class said that was my bra size. I was mortified but ignored them. I was determined to see his concert and got the chance when he came to McNichols Arena in August, 1978. I turned 15 in May, and the tickets were the best gift my Mom ever gave me. I got to go with my best girlfriend Marcie, and I still feel like it was yesterday when I think of him. He was everything I imagined and more, and I remember how he kept smiling at all of us screaming girls. He acted almost as if he was embarrassed that we went crazy over him. I think he was very humble, and that made me love him more. His hair was long and he had an amazing smile. He wore very tight pants and I wondered if the pictures I had seen of his hairy chest were real. I had seen many and knew that his older brothers were very hairy. Well, he took off his shirt and was just like them, and I dreamed of that moment for months afterward. It was the highlight of my teen years. I was even more in love with him after the concert and remember how upset I would get when Teen Beat or Tiger Beat had pictures of him with a “girlfriend”. I was devastated. I didn’t want Andy to be with anyone but me, and I created all kinds of fantasies about “our love” and him being my boyfriend. For the next ten years, he was my dreamboat. Time really didn’t change anything where Andy was concerned. Long after he was gone, no matter who the cool singers were, whether it was Hanson, or Backstreet Boys or Justin Timberlake, or New Kids on the Block, Andy still was my number one. His fans are unique people, I think. They know he was special, not just a teenage singer but a very special person with special talents. I treasure the “Andy years”, and I will always miss him.